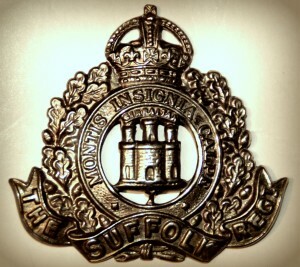 Regiment: Suffolk Regiment, 7th Battalion attached 35th Mortar Battery. Relatives Notified & Address: Son of William & Emily Butcher, of 9, Grimwade Street, Ipswich. 1891 4, Kemball Street, Ipswich. Oliver was 5 years old and living with his mother & siblings. Emily Butcher (nee Harris), 34, a Laundress, born Ipswich. Edith Emily Butcher, 11, born Ipswich. William Frederick Butcher, 9, born Ipswich. Edwin Arthur Butcher, 3, born Ipswich. Miriam Eva Butcher, 1 month, born Ipswich. 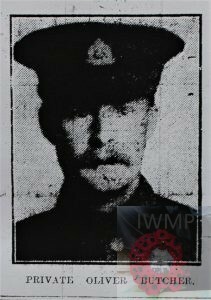 In 1891, at 8, Marlborough Street, Swindon, Wiltshire, Oliver’s father William Butcher, 33, a Bricklayer, born Ipswich, was a boarder at the home of 49 year old, George Ratcliffe, Blacksmith for S.W.R. 1901 4, Grimwade Street, Ipswich. Oliver was 16 years old, a Bricklayer’s Apprentice. He was living with his parents & siblings. William, 43, a Foreman Bricklayer. Ethel, 21 a Stay Fanner. Violet Marie Butcher, 8, born Ipswich. Frederick Alfred Butcher, 3, born Ipswich. 1911 9, Grimwade Street, Ipswich. Oliver was 25 years old, a Bricklayer – Builder. He was living with his parents, siblings & niece. William, 53, a Bricklayer – Builder. Edwin, 24, a General Labourer. Marian, 20, a Domestic Servant. Beryl Irene C. Butcher, 1, born Ipswich – died 1912. Soldiers’ Effects to Emily Butcher – mother. The two men depicted above had an experience which falls to the lot of but a few. Stretcher-bearer W.F. 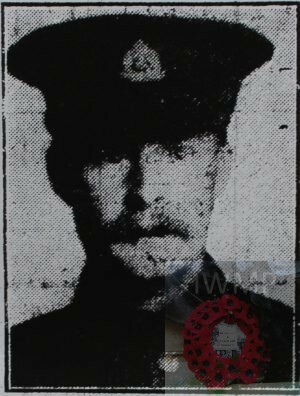 Butcher, of 43, Boston Road, was attached to the 4th Suffolks, and he met his brother, Prvt. Oliver Butcher, of the 7th Suffolks, amid the din of battle, after having lost sight of each other for 14 months. Words are unnecessary to describe the joy which both of them felt when they met and clasped hands on a battlefield in France. 1 Pings/Trackbacks for "OLIVER THOMAS BUTCHER"